Since our Luke died last month (see Best Present Ever in the Memorials) we have been wanting another Aussie, We had adopted one at a nearby shelter,her name is Mylee, but it didn't work out because of our Chihuahua, who was intimated by her size and playfulness, and of he course responded by barking, snarling, growling and nipping. I'm happy to say that Mylee did get adopted by another family two weeks later. So, instead we went and got ourselves a toy Aussie. We figured it was a good compromise. Small, yet the same features and personality of the Aussie breed (I know there are those who say its not so, but it is) regardless, we brought out little guy home 2 days ago, and through tears my husband and I watch him and smile as he reminds us of our Luke, and yet is not, and is so little, and young. Our Chi is doing much better with him, although we are working on his Bullying, but he's accepted him for the most part, and when they are not chasing each other, they are napping. We've yet to agree a name for the little guy, because he's so darn cute. after days of going back and forth on a name for our little guy, we reached a compromise and gave him 2 names. haha, yep, he's got so much personlaity, we fiqured, although he's a Toy Aussie, he can definately pull it off. So we named him Cooper-Kody. He and our Chi are getting along pretty good now, and its only been 4 days, so its a good match we are happy to say. Why not call your your new puppy Grateful!!!! Just like the title of your recent post. God Bless!! I called my guy 'Nub'. Really suits him & he's called 'Nubbers' or 'Nubby Nubberson' more often than not. 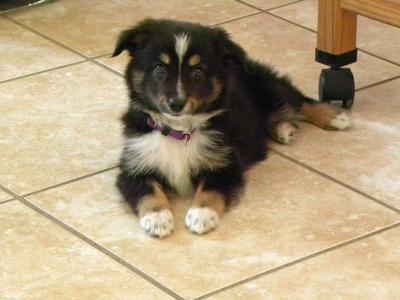 He is now a 3yr old Tri colored Minnie Aussie although he is a good size at 45lbs. Have had him since he was 11 weeks. Your guy looks like a 'Newt'(Newton) to me. Enjoy him lots, they do grow up so fast don't they. Good luck! OMG what a cutie he is!! !